The bad faith attacks on Palestinian-American activist Linda Sarsour have reached new heights in recent days. They have been revived and risen in intensity after the massacre of 11 Jews in a Pittsburgh synagogue late last month. I’ll have more to say on this very soon, but right now, I wanted to share the message below that was distributed by Rabbi Arthur Waskow of the Shalom Center. Rabbi Waskow bracketed the statement with some comments of his, and you can see these here. It is important, to be sure, to hear Sarsour’s own words, in full context rather than as happens to often, framed by others. But it takes on a greater importance right now. The very real escalation in attacks on Jews in the United States have had absolutely nothing to do with Israel and its human rights violations, but have a very strong connection to the hateful, anti-Semitic ramblings of Donald Trump. The Jewish right has tried to distort this reality because they support Trump–not only in his anti-Semitism, but in his broader racism and authoritarianism–and because they never miss an opportunity to try to frame all criticism of Israel as being based in anti-Semitism, despite the clear reality that this is rarely (not never) the case. Linda Sarsour is, in many ways, the lightning rod for all of this. 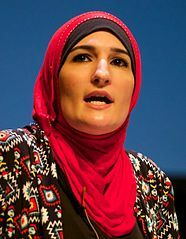 If we are to understand what is going on in America right now, and if we are to stop this rapid rise in anti-Semitism and all that goes with it (it is certainly true that anti-Jewish violence and hate speech tends to be a canary in the coalmine for the rise of broader hate movements like white supremacy), hearing Sarsour’s voice in full and clearly, is crucial. She is the very epitome of the reality that dedication to equal rights for all–a dedication that even progressives and liberals all too often find reasons to exclude the rights of Palestinians from–is the only way to guarantee equal rights for any of us. Here, then, is Linda Sarsour’s message. This is not an email in defense of Minister Farrakhan. He can do that for himself. We have been CRYSTAL CLEAR in BOTH of our statements that we REJECT antisemitism and all forms of racism. We have been CLEAR that Minister Farrakhan has said hateful and hurtful things and that he does not align with our Unity Principles of the Women’s March that were created by Women of Color. Minister Farrakhan will tell you himself that he does not belong to nor adhere to our progressive movement or yours. We are trained in Kingian nonviolence, the ideology of Dr. Martin Luther King, Jr. that at its core calls us to attack the forces of evil not those doing evil. We believe in redemption for people of color who have been discarded, denounced and condemned for centuries in this country. People who engage in acts or behaviors or hold beliefs based on their own historical trauma. It’s why we are not ashamed to work with formerly incarcerated individuals who have committed crimes that for some in society would have determined and decided to give them death. We have been slandered for working with criminals – but we are committed to a movement that leaves no one behind. Some folks who claim to be in the resistance or represent the resistance have no ideology or theory of change and have no understanding of the nuance that comes with organizing with communities of color because they have not done the work – and I pray that they do meet, build and learn because it will transform how they show up so they can help and not harm. Last year when a St. Louis Jewish cemetery was desecrated, with no hesitation I raised close to $165K for its restoration and because of the generosity of many in my community it allowed for the restoration of another Jewish cemetery in Colorado that was neglected for years. Immediately after the Tree of Life shooting, my colleague Tarek and I (through MPower Change) raised $206K to pay for ALL the funerals of the 11 innocent Jews that were killed. My role as a movement leader is not just to say profound words it is to set an example of what meaningful allyship looks like that is beyond thoughts and prayers. This was all erased. Oped after oped after oped after quotes from people who want to see their names in print and barely any mention of our contributions when they decided to tear us down. The labels of antisemitism were here before the Minister Farrakhan controversy 8 months ago. Who remembers when a campaign was started by the alt-right and right-wing Zionists to get me disinvited from a CUNY commencement speech last June? Who remembers the campaign against me last fall around my participation in a New School panel about the importance of combatting antisemitism in this moment with Jewish Voice for Peace and Jacobin Magazine? Minister Farrakhan was not even a factor yet in the conversation. I was already being labeled an antisemite and by extension the Women’s March. It’s very clear to me what the underlying issue is – I am a bold, outspoken BDS -supporting Palestinian Muslim American woman and the opposition’s worst nightmare. They have tried every tactic at their disposal to undermine me, discredit me, vilify me but my roots are too deep and my work is too clear and they have not succeeded so by proxy they began attacking my sister Tamika Mallory – knowing all too well that in this country the most discardable woman is a Black woman. Tamika has been disinvited from some things, and her twitter account that I have access to is full of hate that is unfathomable, saturated with the N-words and worst things said to Black women. I will NEVER throw Tamika away. My loyalty to Black women who have risked their lives for all of us is and will be unshaken. I will continue to hold Tamika up because she has done that for too many people that society has written off. Tamika and I are women with our own agency. We speak for ourselves and ourselves alone. We are being stripped of our agency when every few months we are asked to condemn the Minister about words that we did not say, nonetheless the words of a man who did not consult us on his words. We are being held to standards that no one would hold themselves to. I can share numerous examples of times when movement leaders could have said more and done more for various communities or in response to hateful things that have come from their communities and their “leaders”- blatant anti-blackness, Islamophobia, anti-Palestinian rhetoric – yet that is UNFAIR which is why I don’t expect it nor demand it. As a Muslim, I know all too well that I am expected to answer for other Muslims’ actions when white folks never have a second thought about having to do that. — This is a feature of white supremacy. Let’s also recognize who the majority is that leads the attacks against women of color leaders – not people of color led institutions or activists. Wonder why. Who benefits when a powerful, effective and proven organization is attacked? Who benefits when the movement is divided? Who benefits from the confusion and the fractures? Not us. Not marginalized people. Not those who are counting on us to win. Let us not fall for the longstanding tactics of white supremacy of divide and conquer. Unity is NOT uniformity. I am not building a unified movement where we will all agree on every single point and issue. I am building a complex, intersectional movement with the clear understanding that it will be messy and uncomfortable because if it was going to be easy someone would have done it a long time ago and we would all have our rights and be enjoying our lives in a free democratic country that treats us all with dignity and respect. But here we are. We have seen UGLY. I pray that none of you have to experience what we have. A litany of death threats, unsolicited hate mail some with threats of violence. FBI visits to notify me of credible threats to my life that I had not even seen, the need for security detail, surveillance systems for my home – I don’t say this for any pity or sympathy because I am NOT a victim, I am a survivor of a white supremacist system that wants to ban and rid itself of people like me and Tamika, I say this to say that these public toxic conversations invite these things to happen to us and we all have a responsibility to want us to be safe and out of harm’s way. Tamika and I did not choose to be activists, this work chose us. This is not a side job, or a labor of love – this is a matter of life and death for the communities we love and come from. I ask you all to model how we approach each other in the movement. Have conversations, reach out, ask questions, give benefit of the doubt, contextualize moments outside of your own personal feelings, remind yourself of the good this person or persons or organization has done. Use critical thinking skills. Be honest with your feelings, speak from the I, propose solutions and not demands. Challenge people in your circles, engage people. Tearing down, threatening movement leaders with “say this or else we won’t do this or if you don’t say this then its meaningless” is not the way. The Women’s March is an important institution in this resistance. We have organized the largest single day demonstration in American history, we have been the catalyst for 20,000 women to run for office, we have trained thousands of women in civil disobedience and direct action, organized the largest women led civil disobedience back in June around family separation, co-led close to 30 days of organizing around Kavanaugh and shifted the entire narrative, worked diligently with many of you on elections in key states winning back the House and NOW we are in the midst of organizing another HISTORIC mobilization to remind the Administration that we are still here as a resistance and send a message to Congress and yes to our friends in Congress that we will create the political will for them to be brave and hold them accountable to the platforms they ran on. Thank you for reading this far. I know for some this may not have been easy and may have triggered you and I see you. Sit with this. Absorb it from a place of love and commitment to making this movement work. I pray that our Jewish family recognizes that this resistance is for you too and that you embrace the solidarity we have shown because we have a lot more to give. I am available for one-on -ne conversations and am committed to making the time. Stay focused. The real threat is white nationalism and white supremacy. They want to destroy us all. We are all we got and you know that you can count on me and the Women’s March leaders to continue to be bold and put it all on the line. We hope to see you on January 19th, 2019. We promise you that we have remarkable things in store and you will leave inspired once again.